September 12, 2018, 11:08 AM · One of the great mysteries of the theme park business continues to be why some major theme park chain hasn't bought the rights to Aardman's animation franchises. Wallace and Gromit, Shaun the Sheep, and Chicken Run feature engaging characters and delightful world-building — the key elements in supporting a successful theme park attraction. Aardman's movie and TV specials long have been favorites in my family, and the studio's four Academy Awards speak to its critical and popular appeal. Wallace and Gromit feature in a dark ride at England's Blackpool Pleasure Beach, and Chicken Run was featured in a walk-through briefly at Universal Studios Hollywood ages ago. The one-time Paramount-themed park planned for the London suburbs also was to include an Aardman-themed land, too. But I suspect that many theme park fans would like to see more Aardman-themed attractions in more parks. Now Sally Corporation has stepped up to satisfy that demand. 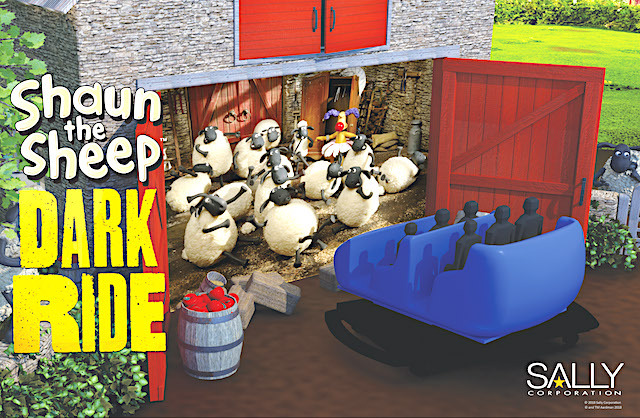 It has announced a new Shaun the Sheep-themed dark ride that it will be making available to parks and family entertainment centers, starting at the European Attractions Show in Amsterdam later this month. "Shaun the Sheep loves new adventures and we’re thrilled by the opportunity to provide Shaun's global family audiences with a completely unique way to immerse themselves in the world of our characters," Ngaio Harding-Hill, Senior Manager of Attractions and Live Experiences at Aardman, said. "Integrating Shaun's slapstick humour and farmyard antics into a thrilling dark ride experience promises to be an exciting creative partnership that we hope audiences will adore." Concept art courtesy Sally Corp.
"With Sally’s ability to scale dark rides to any budget or footprint, the possibilities are endless. This attraction is perfect for any park or FEC looking to satisfy their family demographic," Lauren Weaver, Sally’s Director of Marketing & Business Development, said. "From farm-themed attractions and play parks, to cafes and stage shows, people are noticing the universal appeal of this popular IP and integrating it into attractions world-wide. 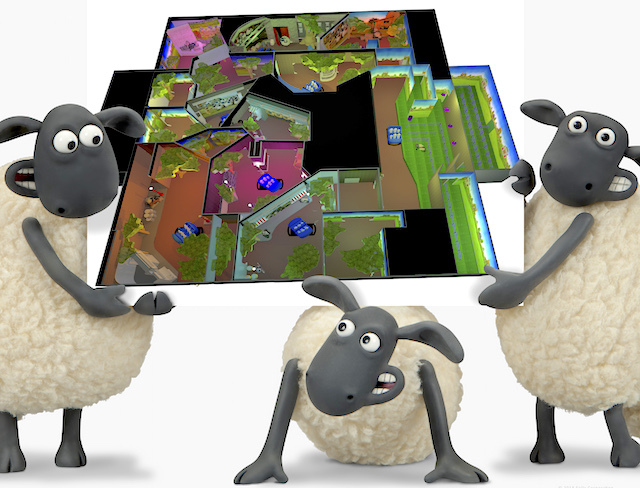 Now, Sally gets the opportunity to join in the fun and create a fully immersive Shaun the Sheep dark ride that will be nothing short of a flockin’ good time." The four-minute ride features several scenes around the Mossy Bottom Farm — featuring practical sets, media, and animatronics — but Sally says that it can customize the layout of the attraction to meet a client's site needs. That points out this is not yet a "done deal" attraction that will be coming to a specific park on a specific date. Ultimately, it's a product for sale. But Sally is known for developing popular theme park attractions, including the Theme Park Insider Award-winning Justice League: Battle for Metropolis as well as dozens of other interactive dark rides, so this is a match of a proven developer with a popular IP. So who will step up to buy it? I think you're overestimating the appeal of Aardman Robert. I love their work (Flushed Away is one of my favorite animated movies of all time, and I really like Pirates: Band of Misfits as well), but they're small potatoes in a huge IP market. Aardman's 8 feature films have only collectively grossed $334 million in the US (just over $1 billion worldwide), and while their TV projects have some reach, there are dozens of other untapped IPs that are far more proven. People always harp on the limited appeal of horror franchises, but Aardman is practically equivalent to many popular horror franchises like Saw ($453M domestic and $976M worldwide), Scream ($332M domestic and $604M worldwide), Paranormal Activity ($401M domestic and $891M worldwide), and The Conjuring ($484M domestic and $1.34B worldwide). For additional comparison, the 5 Ice Age movies (completely available IP in the US) have grossed a collective $764M US/$3.22B WW, and the 2 Rio movies (also available IP) have together grossed $275M US/$985M WW. My family and I LOVE Aardman too, but it's just not an IP that moves the needle much outside of the UK. Sally's going to have a tough sell on their hands, especially if they are charging a premium for these attractions to compensate for cost of the Aardman license. You could make an attraction nearly identical to Shaun the Sheep around Old MacDonald (in the public domain), and probably draw the same interest. Gobbler Getaway (a Sally Shooter at Holiday World) would probably be virtually identical to what I think a Chicken Run attraction would look like, and doesn't have the additional cost of maintaining the IP license. I remember at the Blooloop conference in 2015, Aardman talked about a Shaun the Sheep ride & themed area being developed for a European park, and gave the impression that an announcement was pretty imminent. I wonder what happened to that... and if the design work that went into it is what we're now seeing being offered to the wider market.